This was a much fondled piece of linen. One of those cuts of cloth that you visit occasionally only to close the cupboard door knowing the pattern you had in mind falls short. How best to place the border design so the fabric sings? Not too many darts/panel lines, but just enough to create a well fitting garment. I was very tempted by a summer ‘sack’ dress. But it just didn’t feel special enough. Colour, border print, fibre, I love everything about this linen. Apologies, no idea of the provenance, thats how long I’ve had this piece! Thanks go to #1 son’s girlfriend who announced the theme for her 21st birthday party – ‘starry, starry night’. Just the excuse I needed to just use this much fondled stuff! I’d worked up a BHL Anna maxi in my head for so long, imagine the disappointment when I found 2 metres of fabric wasn’t enough; tears were shed. The skirt on that Anna maxi is a ravenous beast, so I ‘subbed’ in a self drafted A line skirt with as few darts as I could manage to preserve the border print. By the way has anyone else been following the Crafting a Rainbow Better Pictures Project? Hopefully lots of rooftop wind counts as movement! 2cm waistline ease in a skirt block doesn’t work for me, my skirts always slip down (square waist?) so I’m off to exterminate that damned ease, lest I forget. 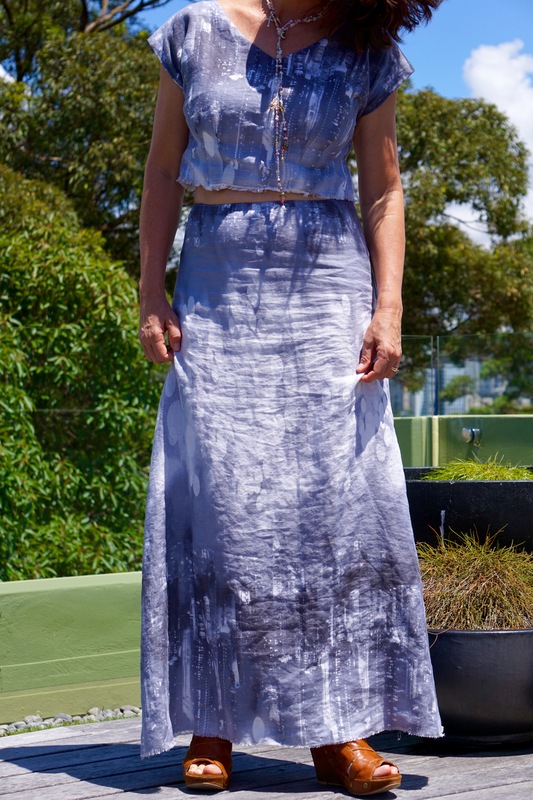 Maxi Skirt’s first incarnation had a drape to the hip (self drafted) but I just wasn’t convinced, so the front was recut from the draped section. Perhaps I should have kept the drape? Vacillation and procrastination Inc. So much pressure for this precious to be right! The faced waistline should sit at my natural waist but falls a little below, showing a little more skin than is ideal. Perhaps a waistband next time? Anyone? faced waistline or waistband? Do you have a preference? 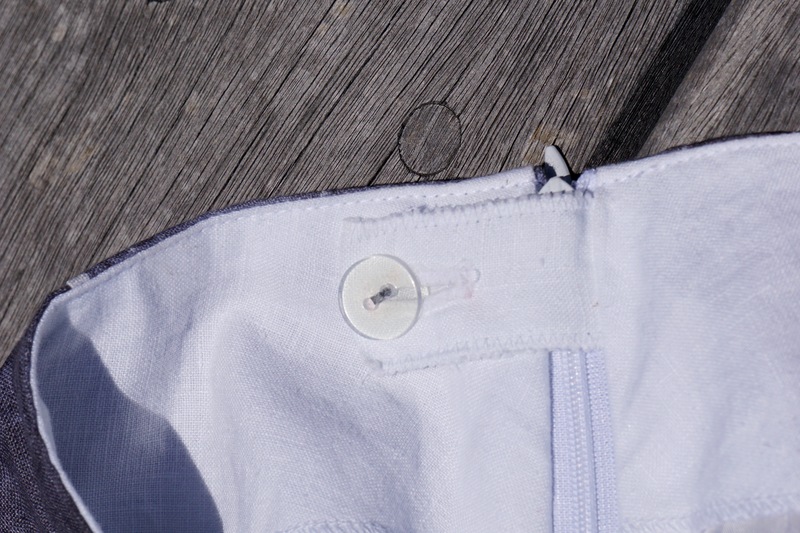 The button tab keeps the skirt zip abutted while one wangles the zip closed, its the small things right? In order to reduce bulk as much a possible, I just zig zagged, it works fine, grosgrain would also do the job. A neat hemline just didn’t seem to cut the post apocalyptic vibe (where is the cloudy miserable day when you want one), so the hem of both top and skirt were frayed. Not a terrible task sitting in front of the TV with hubby late at night, but definitely more time consuming than a nicely stitched hem! Full lining helps a little with the dreaded linen creasiness, this has been worn to 2 parties before these photos. 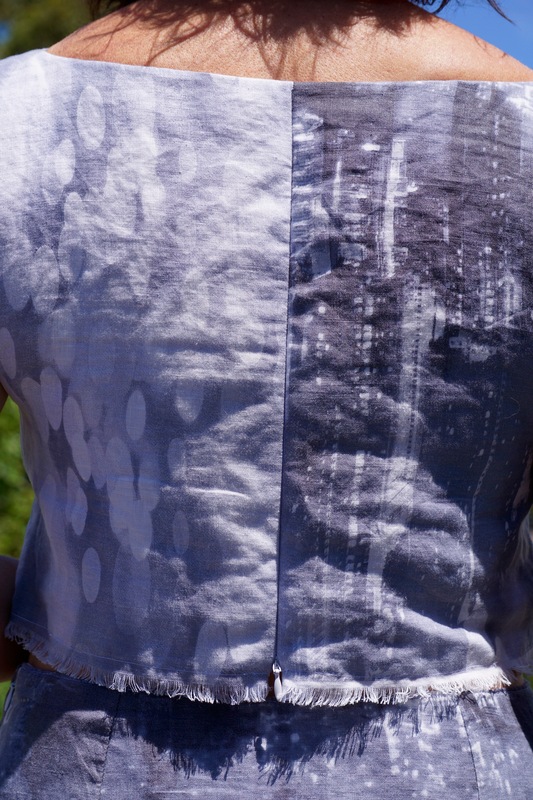 Hygiene alert – the top was washed between wears, its a hot ‘n’ sweaty summer here after all! The original neckline was lowered about 3cm on amiable Anna and FYI, I took out 2 x gape darts from the neckline of about 7mm each JIC. The bodice of the BHL Anna dress was improved no end with a magnificent FBA. I thank Alison of Another Little Crafty Creation for her most excellent Anna FBA tutorial. For my chesticles, it adds fabric in all the right places. The FBA instructions are necessarily convoluted and had me so befuddled that at one point I decided it would be easier to draft my own bodice a la Anna. Started down that track but conceded that those girls at BHL do indeed know their onions! Back to the original collaged version with FBA. Alison’s tutorial has no side seam dart, but I inserted one, I like the look of a neatly fitted side seam and the released darts underboob (technical term?) were getting a tad large I thought. absolutely no chance of pattern matching in 2m of this border print – but I can’t see it, so thats ok! Upside down CB zipper – on purpose since it became apparent that there was no way my massive shoulders would fit through the opening of my waist – nice save eh?! I have no problem with a slivver of skin above the belly button, its a passable abdominal slivver. South of the BB is where it gets all nasty, so I find this revealing style quite wearable though the coverage of a cardi is still comforting and looking at these photos of peri menopausal skin, I’m really not so sure I like any of it. Off to locate those misplaced rose coloured glasses. New Year resolution – buy more fabric in one cut rather than bits, I’m tired of playing pattern tessellation when what I really want is a maxi dress!! The Anna love didn’t stop here though, stay tuned as they say! What a gorgeous fabric! Unlike anything I’ve seen at all! The colours are so soft looking and the graphics.. what is that? A meteorite shower in Manhattan? I reckon the young ones would be slightly envious of you wearing it; you show ’em! Anna is one of my favourite patterns (though my opinion of patterns in generally low) and one of my favourite dresses that I own; I feel transformed in it. The bust darts are very clever, almost providing a kind of padding! Of course, the skirt is way too long for me (so I don’t need as much fabric) and I recall having to take the back bodice in a bit. Have a lovely Christmas in the (*sigh*) sunshine! P.S. I much prefer facing for something to be worn when standing, sitting and eating … waistband is not as comfortable but looks better. What a lovely dress and perfect for a hot and steamy summer. You did a great job turning a dress into separates. and the back of the bodice isn’t un-pattern-matched it’s colour-blocked. Right? I can’t wear faced waists as they slide down or ride up. No hips, no anchor. But I must admit waistbands can be very uncomfortable at times. I’m leaning towards elastic waists these days. Aaaaha, colour-blocked, that was the term I was searching for KaSchu! Thank you! Princess has a very sharp angle between waist and hip bone, it seems perfect for anchoring the dreaded waistband and she wears the well. I, like you it seems have nary a skerrick between waist and hip, makes the anchoring tricky as you say. As I mentioned on your blog, I’ll have a look at Kebvin Sews elastic backed waistband too! Keep cool! I am not sure this is a border print. I think it is a shibori/tie dye piece, probably using indigo dye. You have got a nice fit and the whole look is relaxed and sunny but also unique and slightly regal. In terms of waistbands – I would say this is my least favourite thing about making skirts and trousers. For comfort yes, I agree with you and Sew2pro that a facing is preferable. But a bias cut waist band can be quite a good solution as it does curve in, in a good way. Also I prefer the zip to come up through the waist band. There is a blog post that needs writing on this topic, but we need an expert I think. Finally Happy Christmas. It was lovely to meet you this year. No, its refs a print Kate. The repeat was about 30cm and was the same on both selvages, while the whimsical bubbles ran down the centre. Have to say that made the fabric go a lot further since I could cut skirt sections on the crosswise grain alternately (with fingers and toes crossed the linen would drape adequately). You’ll find your waistband expert in Linda of remake, remodel, reccyle – she sews professionally for designer collections if I’m not mistaken and has just done a post on matching the invisible zipper at a seamline and waistband top. https://remakeremodelrecycle.wordpress.com/2015/11/25/invisible-zips-and-meeting-the-waist-seam/ I’ve asked her to elaborate on the bias waistband if at all possible. Enjoy your Christmas Kate, its just a pagan excuse for revelry after all!! Gorgeous fabric, it looks lovely as a two-piece! I’m still deciding what fabric I want to make my first Anna in, I’d love to find something this beautiful! My favourite Annas are in large prints, but the pattern matching might be a snag Kirsten. I was aware that some ‘fashion’ bloggers call a maxi with no split a mono leg! I do much prefer to break up the skirt with the split, but sometimes its just not possible! Best of luck with her. That is a stunning outfit! I would never have thought of making a crop top Anna, but it’s perfect! The darts at the bodice hem make it all nice and snug. And that fabric! Love it! Thanks Gillian, I have to thank you personally for your inspiration and especially the photographic series. Now to venture into public spaces a little more – eek! I donned my ensemble to go to a Christmas partee last night and took off the top for a more modest one. #1 son, made all sorts of comments till I told him to keep his comments in the nicest possible way! So my next job is to find a scrap of the fabric and create a longer fringe which will cover up the flesh a bit more. I’m sure that way it will make it outside! The first time I wore just the skirt and another shirt, the second time I wore it with a full length apron over, perhaps I’m just not as daring as I thought! This looks great on you. I love the way the necklace works – it makes a very flattering look. I also think your skirt shape is better than the original Anna one, as it suits the border design. From memory, I seem to think the Anna is too full for your fabric. Reading your review, I maybe will give this pattern another go. Having made it when it was first released, I got very frustrated by the extremely gaping back neck. Serve me right for charging ahead without a muslin. I remember wearing the straight waistbands, and they were positioned, more or less onto the top of what we now seem to call, natural waistlines, so on top of the curved waistband, like the skirt you’re wearing. I like a straight waistband for a straight skirt, but the curved, faced ones do seem more comfortable. For me, the lower waistband on trousers and jeans look and feel much better! The outfit is lovely, and the shapes and fullness you chose to use look right for the fabric. You say you have a low opinion of patterns, but I think you see them in the right way, use them as a starting point and alter them to suit you, in this way, your the designer and you can do whatever you like!! Ooops, that was Marianna that has a low opinion of patterns – not me! I have grave doubts about my drafting skills and since I’m always in a hurry, they are improving slower than I’d hoped!! But you’re right, patterns do have to be adapted as needs and they are a great starting point if they’re well drafted in the first place. I’m making the few I buy work hard these days. It takes so much effort to get them to fit, might as well get my money’s worth! One of the commenters had wondered about a bias waistband Linda and I immediately thought of you; being the resident expert n all! Would you put the interfacing on the stretchiest angle too for a bias waistband or will that give too much give? I’m going to have to try the curved variety, might even add it to this baby. Hi Lesley, sorry I thought I’d read it all properly! Me – also always in too much of a hurry. My brain is now overloaded with waistband issues that I could write either the most boring or interesting essay !! depending on who you are?? The normal way you would cut the waistband, like on your skirt, would be to cut it with the straight grain at the centre front and back, meaning the side seams are on the bias. Cutting on the bias simply makes the fabric more clingy or figure hugging so it should sit nicely on the hips! But! you can reverse this and have the bias at the centre front and back and straight on the side seam.I would interface these pieces, depending on the fabric. Think about interfacing as something to enhance what you’re making! I would always use it on the inside facing as a fabric and shape stabiliser, but using it on the front waist pieces is optional. For example on your skirt, because the fabric is soft and looks casual I would not interface it because I would not want to change the feeling of the fabric. If it was made in a tailored, crisp fabric I would interface inside and out to keep the crisp theme. Then there’s the old straight waistband and the other waistband, both cut as one piece with the second one using straight and bias cut!!! 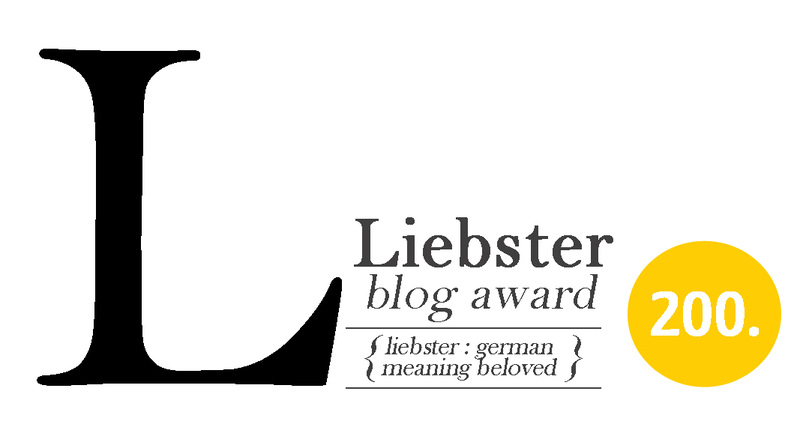 Oh dear, maybe I’ll write a blog post about it and then you can cut your own! What a great choice! I love that she can follow the party theme (I’m completely over themed 21sts) and still have a wearable garment at the end of the day. The fabric is rather special too. Wow, this is gorgeous!!! I have been lurking about your makes to get a better sense of your style and I’m really jiving with your blog/makes, I hope that’s not weird 😏. I want that fabric…and NOW!